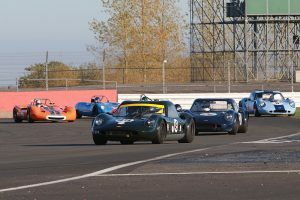 Under glorious autumn sunshine, a weekend of tremendous racing marked the conclusion of the Historic Sports Car Club’s season-long championships during the Club’s Championship Finals Meeting at Silverstone (20/21 October). Across a busy 20-race weekend there was plenty of superb racing as titles were settled and the big winners were Cameron Jackson (Historic Formula Ford), Andrew Park (Historic Formula Ford 2000), Adrian Oliver (Historic Touring Cars) and Keith White (Classic Formula 3), while Mark Charteris and Clive Wood each took a class title in Classic Clubmans. 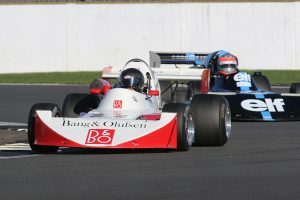 Victory in the first of two Historic FF1600 races was enough to clinch the title for Cameron Jackson after a season-long battle with Ben Mitchell. Mitchell, Richard Tarling, Callum Grant and Ben Tusting were the big challengers to Jackson, but the Lola was in the perfect place on the deciding final lap. Mitchell lost out when he was edged onto the grass on the final rush down the Wellington Straight and that was enough to cost him a remaining shot at the title. Jackson won again on Sunday but only when Tarling missed a gear on the sprint to the flag and allowed Jackson to grab victory by six-thousandths of a second with Mitchell almost level with them over the line. “It’s been a challenging season in every race and there has always been someone to race with, especially with Ben Mitchell. Every single race we’ve been next to each other on the track,” said Jackson after becoming the first champion in a Lola since his team boss Neil Fowler won in 2005. With the Formula Ford title settled on Saturday, Jackson confirmed late plans to contest Sunday’s rear-engined Formula Junior race from the back of the grid in his Brabham BT2 and stormed through the field to win and add the Class E1 title to his season’s tally. Peter de la Roche was a surprise winner on Saturday in his drum-braked Lola after fluid on the track sent Nick Fennell and Andrew Hibberd into spins at Luffield. In the front-engined Formula Juniors, Ray Mallock was unstoppable in his U2 despite the best efforts of Alex Morton. It was Mallock’s first championship title as a driver since 1981 and his first crown in a Mallock U2 from the company founded by his father since 1971. Warren Briggs and Geraint Owen enjoyed two tremendous Ford Mustang battles in the Historic Touring Car races and the Sunday encounter was one of the races of the season as they raced bumper-to-bumper. Briggs, out in his Mustang for the first time this season, jinked ahead in the Complex on the final lap to get the verdict by just seven-hundredths of a second. Bob Bullen did all he could for the title with two class wins in his Ford Anglia, but narrowly lost out to Adrian Oliver who also bagged a class double in his Hillman Imp. Michael Lyons was the class of the Derek Bell Trophy field and thundered his Lola T400 to a commanding victory on Saturday. Lyons was in control again on Sunday before an inlet manifold issue sent him to the pits. Mark Dwyer took over in his March 742 but then fell foul of oil at Copse and a slower car, so victory went to Mark Charteris in his 742. Earlier, Charteris bagged a Classic Clubmans double, but only after two spirited challenges by John Harrison. The bonus point for pole was enough for Charteris to retain his crown, while in the B Sport contest Clive Wood missed qualifying and the opening race due to a wedding in Scotland on Saturday. 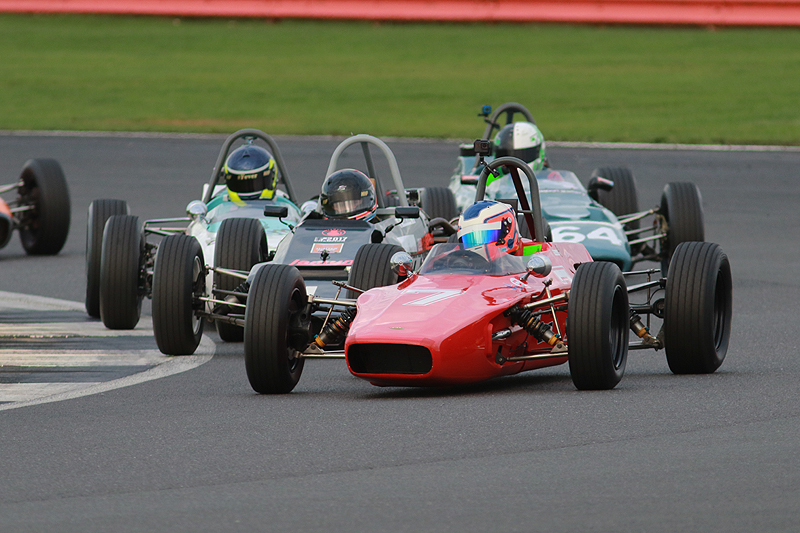 After an overnight drive, he started his Mallock Mk20 from the back of the grid and took the class in Sunday’s race to grab the class title from Barry Webb. Andrew Park sealed a hat-trick of Historic Formula Ford 2000 titles with two resounding wins as Ian Pearson gave determined chase in his Royale RP30. Paul Allen secured the championship runner-up slot with two thirds but had to work very hard on Sunday to fend off the flying Benn Simms. A broken wishbone on Saturday meant that Simms started from the back of Sunday’s grid. Greg Caton claimed two wins on Sunday and the first came when he went solo in Brian Casey’s Lenham in the Guards Trophy. Caton headed a rare one-two for Lenham as John Waggitt/Peter Needham took second and the Lotus 23B of Nick Fennell/Jon Milicevic completed the podium, but had James Schryver’s Chevron B8 right on its tail at the flag. John Davison signed off his title-winning season with another GT class win in his Lotus Elan 26R. Caton had a last-minute offer to race David Shaw’s ex-Piquet Ralt RT1 in the Classic F3 opener and fended off the RT3 of Gaius Ghinn for a stylish win. Caton elected not to start the second race and so Ghinn was able to fend off the Safir of Pat Gormley and end his season with a win. There was plenty of tremendous racing in a strong pack and Keith White did enough to end the year level with Gormley on points and take the title on count back. Chris Levy (Van Diemen RF83) and Andrew Lancaster (Pilbeam SP1) shared concurrent Classic FF2000 spoils after some fine battling. Jon Milicevic ended his Historic F3 title season with another win and his margin was boosted when Andrew Hibberd had a quick spin out of Brooklands. Hibberd had to get his head down and pass a group of cars, including the Tecno of his father Michael, to get back up to second place. Finally, entertaining Road Sports races resulted in wins for John Dickson (Ferrari 308GTB) and Kevin Kivlochan (Morgan Plus 8). Dickson’s invitation class car moved ahead of Charles Barter (Datsun 240Z) to win the 70s counter, while Kivlochan went to the front of the Historic pack when John Davison’s Lotus Elan hit distributor problems and pulled off with three laps to run. Larry Kennedy (Lotus Elan) and Larry Tucker (Shelby Mustang) were delighted to join Kivlochan on the podium.